Italian refit yard Cantiere Rossini has enjoyed a busy first season after opening its doors in Pesaro earlier this year. The new superyacht refit company was established after a group of investors purchased the Adriatic coast facility that was formerly known as Cantiere Navale di Pesaro. Named after the world renowned 19th century Italian opera composer, who was born nearby, Cantiere Rossini is the result of a €15 million investment and a full restoration and reorganisation of the site. Captain Stewart Parvin has been appointed as CEO, while Alfonso Postorino, formerly responsible for the refit division of ISA Yachts, is the shipyard director. In its debut season Cantiere Rossini has already welcomed three superyachts for maintenance work: the 55 metre Benetti Lady Michelle (ex-Cakewalk), the 34 metre Admiral yacht Alhena and the 40 metre Benetti Al-Bouchra. The refit yard features seven berths measuring up to 55 metres, all of which are fitted out with 400V, 250/125 amp shore power connections and freshwater hook-ups. For added peace of mind, the site has 24/7 security and CCTV cameras throughout. 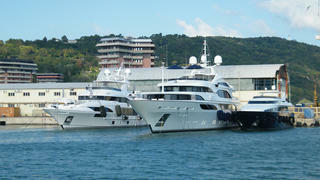 Visiting owners and crew can also park right alongside their yacht, with parking available next to the passarelle. The yard adds that it is equipped to carry out a wide range of jobs from full paint works, mechanics and electronics upgrades, to interiors rebuilds, redecoration or even a full superyacht systems refit. Future expansion plans for Cantiere Rossini include a 15,000 square metre hard standing area and travel lift capable of carrying yachts up to 600 tonnes, both of which are due to be installed in 2017. Looking further ahead, a pair of paint sheds and 16 luxury crew apartments are planned for 2018.